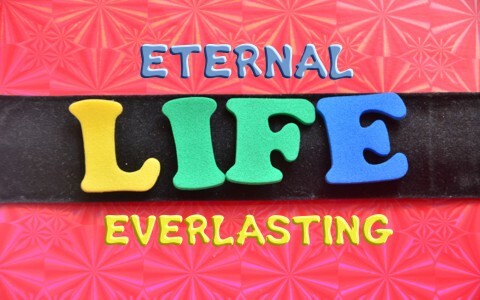 What Is Eternal Or Everlasting Life? When the Bible mentions that believers have eternal life, what does it mean? Is it obvious or is there more to it that we might think? Jesus once astonished His listeners by talking about ridding themselves of sin by saying “if your hand or your foot causes you to sin, cut it off and throw it away. It is better for you to enter life crippled or lame than with two hands or two feet to be thrown into the eternal fire” (Matt 18:8). We might understand the idea of having eternal life and that it means it lasts for all time but the concept of eternal fire or hell is rejected my many today but their rejecting the truth. The Greek word Jesus used for the word “eternal” as in “the eternal fire” is “aiōnios” and it means “without end, never to cease,” and “everlasting” so the idea of some teaching annihilation is not biblical. It has the fate exactly the same for the people who most people consider good people and the Hitler’s of the world. If they both meet the same fate, is there a complete and fair justice ever served? What about where Jesus indicated that there will be differing degrees of punishment in hell when He said “And that servant who knew his master’s will but did not get ready or act according to his will, will receive a severe beating. But the one who did not know, and did what deserved a beating, will receive a light beating. Everyone to whom much was given, of him much will be required, and from him to whom they entrusted much, they will demand the more” (Luke 12:47-48). Here it seems that some who knew better, perhaps by hearing the gospel and then rejecting it will fare much worse in the judgment than perhaps those who didn’t know the Master’s will, like the native in the deep woods of the jungle. When Jesus was about to resurrect Martha and Mary’s brother Lazarus, He told Martha “I am the resurrection and the life. Whoever believes in me, though he die, yet shall he live, and everyone who lives and believes in me shall never die. Do you believe this” (John 11:25-26)? In the Greek, Jesus was saying that whoever dies a natural death will surely live again, if they believe in Him. Death is not final for the believer. It is only the beginning of eternal life, even though Jesus spoke about whoever believes in Him already has eternal life and will never perish (John 3:16). The phrase “have eternal life” is a present possession. It’s like if I went up to someone and gave them my car keys and say “here are the keys to my car,” they already have possession of the car in the keys and they have the ability to drive the car due to the car keys I have given them; they only have to use the keys to unlock the car and start it. That’s the language Jesus uses in John 3:16 and in John 11. This life Jesus spoke about is eternal or perpetual, and not even death can take it away (John 11:25-26). Even though Abraham, Isaac, and Jacob were physically dead, long ago, Jesus spoke about them as if they were still alive because they are, as He said “‘I am the God of Abraham, and the God of Isaac, and the God of Jacob’? He is not God of the dead, but of the living. You are quite wrong” (Mark 12:26b-27). To have confidence that you have eternal life you should know that you are living like one who has eternal life. The Apostle John said “I write these things to you who believe in the name of the Son of God that you may know that you have eternal life” (1 John 5:13). That’s the purpose of his writing 1 John. It was so that they would know and how are they to know this? Here’s how they would know that they don’t have eternal life, “No one born of God makes a practice of sinning, for God’s seed abides in him, and he cannot keep on sinning because he has been born of God” (1 John 3:9) and so “By this it is evident who are the children of God, and who are the children of the devil: whoever does not practice righteousness is not of God, nor is the one who does not love his brother” (1 John 3:10). These are the true marks of an unbeliever; they do not practice a righteous way of life and they do not love their brothers and sisters. That’s why John said “it is evident” who the children of God are. To those who say that they are Christian and yet say they cannot stand Christians, I have a difficult time reconciling this because they claim to know Christ and love God but do not like God’s children. That seems very contradictory to me. It is clear that “Everyone who hates his brother is a murderer, and you know that no murderer has eternal life abiding in him” (1 John 3:15) and remember that Jesus equated hate with murder in the heart (Matt 5:21-22). Whoever believes in Jesus has passed from judgment to eternal life (Rom 6:23) because they believe in Jesus Christ (John 3:16) but doesn’t the Devil know Jesus is the Savior and that’s not enough to save him? Yes, it must be the two wings that fly us into the kingdom and those were the very first words Jesus said when He began His earthly ministry; “The time is fulfilled, and the kingdom of God is at hand; repent and believe in the gospel” (Mark 1:15). If there is no repentance, then there is no genuine belief. Repentance means a change of mind in that you change your mind and agree with God about your sinful acts, forsaking sin so it’s not enough just to believe in Jesus; that only qualifies you to be a demon for they believe and tremble (James 2:19). No, Jesus said you must repent and believe. To believe means to be living in and walking in obedience to God. To repent means to change your mind about how you think and live. True repentance results in a change in the way the believer lives — ungodly behavior becomes Godly behavior. If you believe in Jesus, you have eternal life and nothing or no one can take it from you. How certain am I of this? Paul reassures us “that neither death nor life, nor angels nor rulers, nor things present nor things to come, nor powers, nor height nor depth, nor anything else in all creation, will be able to separate us from the love of God in Christ Jesus our Lord” (Rom 8:38-39). Paul sounded certain. Are you? Related reading: Is Hell Really Eternal? I LIKED DA ARTICLES. FOR DISTRIBUTION TO POOR N RURAL FOLKS, DO U HAV E ANY BIBLE TRACTS? IF U’VE, PL. SEND THEM TO US. Thanks brother…praying as you “Go” into all your part of the world Jim. I like the metaphor of taking the keys and driving the car. Starting with your new everlasting life from the point of salvation. Before that we all have eternal death. There is only one instance in the old testament referencing God as “eternal”. It is found in De 33:27 “The eternal God is thy refuge”. This Hebrew word translated “eternal” speaks of “ancient” existence. IOW, eternity past. The new testament Greek word translated “eternity” implies a forward (of this world) existence going forward forever, for we are not as God, in having no beginning. It is an unfortunate translation, IMO, to reference man as having “eternal” life. This is not to detract from your broader point that we can have everlasting life as we place our trust in the Savior. Good stuff my friend. You always contribute so much to this website and also to my understanding my brother.